A 'hands on' repair project with students and staff of the Florence Nightingale Faculty of Nursing and Midwifery at King's College, London. The Georgi Cardigan a leopard print cardigan given to Bethan, a midwifery student, by her friend. She described feeling vibrant when wearing it. The sleeve seam was split from the armpit to cuff and Bethan choose to repair it with embroidery thread. Ellie's Boyfriend Jumper This jumper belongs to one of the midwifery students at King's. We were able to count 13 moth holes to the front and at least as many at the back. Ellie choose fine wool for the repairs. The Joseph Blanket, another feast for London moths. There were more than thirty holes in this very beautiful blanket and I was able to darn them with yarn saved by its knitter. Ian's jumper was damaged by barbed wire at the inside elbow of both arms. A really satisfying darn with yarn saved by his mum, who had knitted it. These machine knitted gloves had been nibbled by moths. I darned them with fine embroidery wool. These were very worn, especially at the thumb and where the inside of the palm came into contact with the handlebar of the bike. They were also torn where the wrist of the gloves meet the hand from repeated pulling on and off. The larger holes were patched with soft leather. Weak areas were reinforced with small seed stitches in coloured wool yarn. These contrasting colours reflect the original design idea, which is suggested in the pink tags. 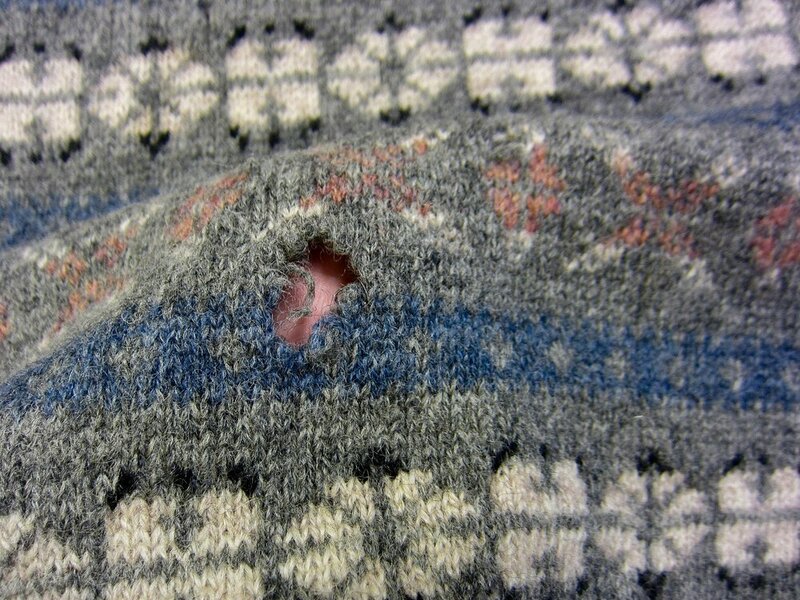 The visible darning indicates the points of wear. Machine knitted from cashmere, one large hole - probably moth damage - repaired with green wool.